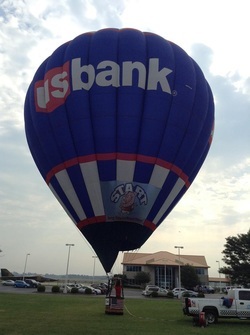 This weekend, Olathe, KS will host the Great Midwest Balloon Fest on the grounds of the Great Mall of the Great Plains. In its third year being run by Skycab Balloon Promotions, Scott McClinton and his team are bringing all the trailers and four wheelers to set up shop for a competitive and exciting weekend of balloon flying. Friday and Saturday night will be ride and tether operations and a balloon glow split between the pilot groups while Saturday and Sunday mornings will be competitive flights. Currently the weather looks a bit wet on Friday but clearing up for Saturday morning and for the rest of the weekend. One of the biggest weather challenges over the years has been the wind in the afternoons and this year it might also be windy in the afternoons. Favorites for the weekend have to be the KC locals to include John Petrehn (last years winner) and Jason Jones. Jason was in first after the Saturday morning flight while flying his ride balloon with four passengers! Others to watch out for will be anyone from Texas and with two good flight opportunities its anyones race. Updates will be most frequent on our twitter feed here. Visit this link for the electronic version of the competition map.